The Bushy-crested Hornbill is the most common hornbill of the lowland forest in Borneo. It moves around in small flocks of up to a dozen birds, feeding on fruit and insects. 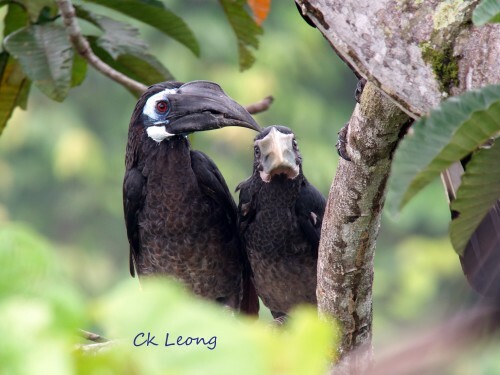 Whereas most other hornbills breed in pairs, the Bushy-crested Hornbill has a social system of cooperative breeding, thus enabling the species a much higher chance of survivalabilty in a limited habitat. Last month while at Tabin Wildlife Reserve I saw this male Wreathed Hornbill Rhyticeros undulatus steadily feeding his sealed-in female partner on this huge “Mengaris” Koompassia excelsa tree. I estimated that the nest-hole would be about 40m above the ground. I believed this is still the incubation period and the male has a huge effort ahead to feed both the female and the coming chick. Studies done in Thailand have indicated that the Wreathed Hornbill would have a feeding range of up to 10 km2 during this breeding season. On Mount Kinabalu I have seen this hornbill in flight near the mountain huts at around 3,200m. More power to you, Mr Hornbill. On a recent morning trip to the Sepilok Rainforest Discovery Centre’s canopy walkway with my friends Nikki and Hayley, showy and loud hornbills came close and produced a wonderful display for all the visitors. 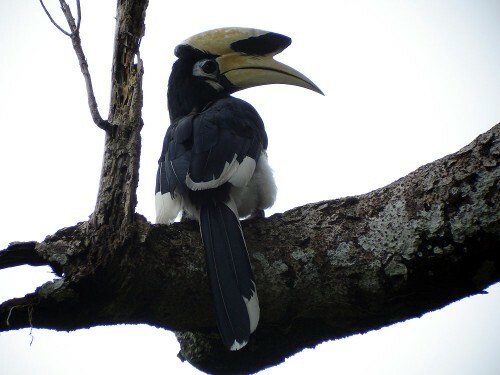 The Oriental Pied Hornbill Anthracoceros albirostis is the smallest of the Bornean hornbills. It is also the most common, most probably due to its ability to adapt to changing habitat. I have seen it feeding on oil palm fruit and on one occasion took a young of a White-breasted Wood-swallow. It is probably most at home in primary forest but also does well in swamp forest. 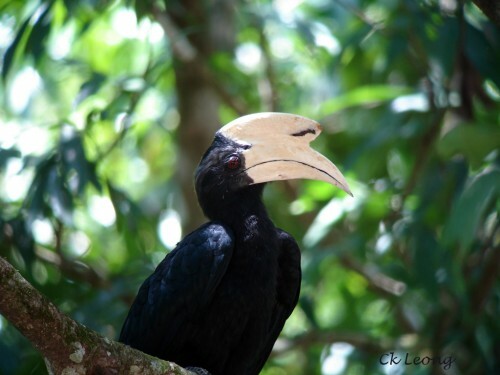 The Asian Black Hornbill Anthracoceros malayanus sticks to primary forest and its fig trees and because of the continued reduction of such forest, this bird is considered as near threatened. 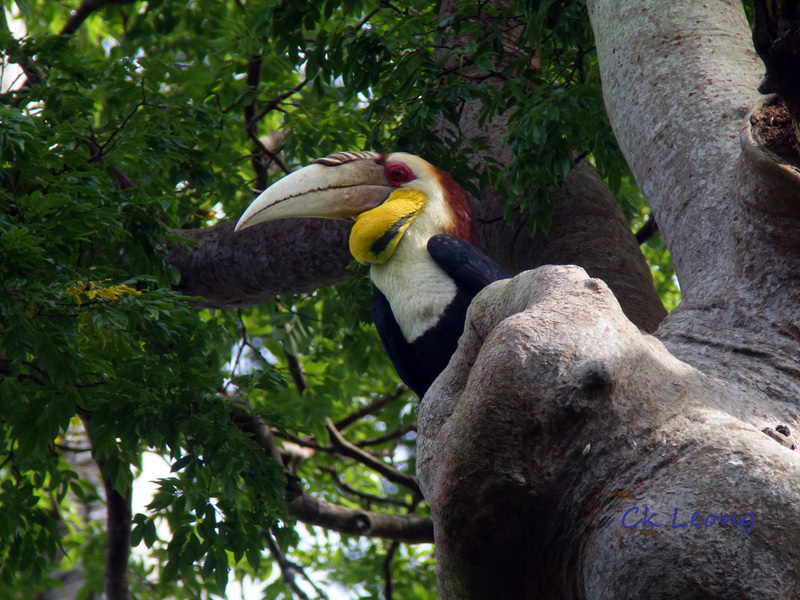 I still rate it as more common than the hornbills with the exception of the Pied and Wrinkled. Much have been said about the nesting habits of hornbills. 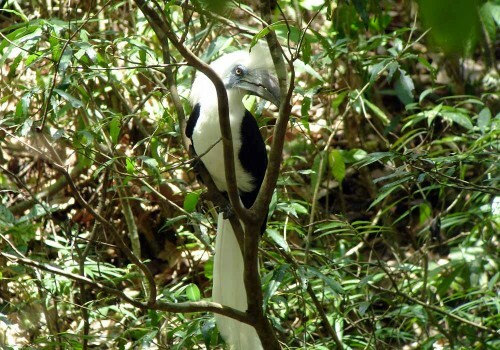 Additionally the White-crowned Hornbill Berenicornis comatus is also one of those hornbills which occasionally practices co-operative breeding where other birds will take their turn at feeding the imprisoned female. I saw this particular male bird foraging at almost ground level. On all previous occasions, I saw them at around the middle storey of the forest. I continue to be impressed with the fantastic white crest.